To give Alan a better look at the city, Maggie offered to drive the long way to his lodging. She seemed more relaxed, now that she had delivered Alan to her boss. Alan, also more relaxed, finally noticed the car they were in - a mint-condition VW Kombi! "This thing must be 50 years old," he said. Margaret explained that these vans were imported in the late 1960s and are constantly maintained. "Automobiles are very rare here, due to the high tax on them, and because petrol is so expensive. These cars originally belonged to the Russian navy, and were left to us at Independence. They were already 30 years old - too beat-up to take with them. We cleaned them up and still use them!" 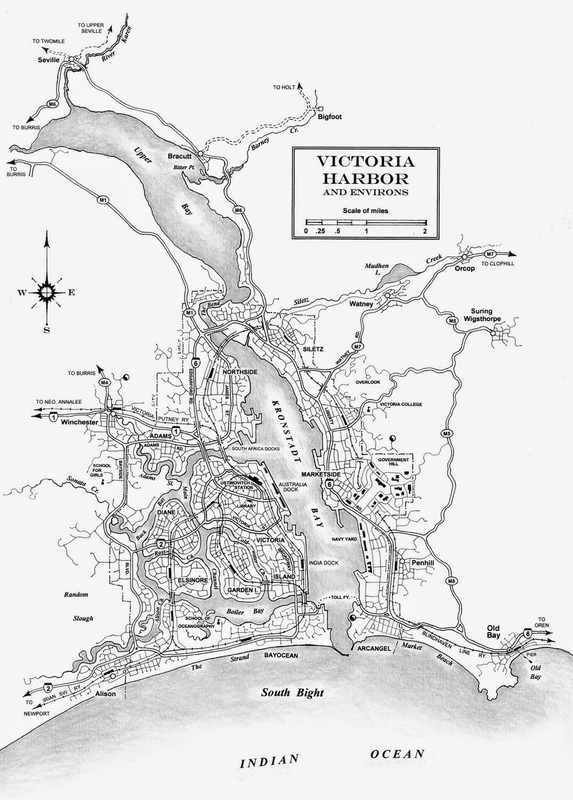 Margaret drove down from Government Hill to the ferry at Archangel (bottom of map). Then she took him through the Bayocean neighborhood to Alison Beach, then north on Hwy 2 to Diane Island, then to Victoria Island (center of the map, above). They passed many pedestrians, some pedicabs, a few strange-looking cars with solar-panel roofs, a city bus or two but very few petrol-driven cars or trucks. The city was busy, but seemed eerily quiet. She drove him to Cold Water Lane where a room in an older pensione had been reserved. She pulled up and told Alan to speak to Mrs. Plakaford about his room. Alan took this as a cue to get his bag - Margaret seemed in a hurry to move on. "Well, good luck Alan Faramond," she said from the driver's seat as Alan got out. "I trust you'll have an interesting journey on our island, and I'll expect you to call in once a week. There is a telephone at your apartment in Hazel. We've also enclosed some travel money with your other things. If you've no more questions, I must be getting on...!" Alan grabbed his bag and walked off the ship. Other passengers were disembarking as well, and Alan was touched by all the hugging and delighted greetings from friends and relatives - he warmed to the energy of their joy, even though he knew no one! At the dock, Alan saw someone holding a sign with his name on it, and figured that might be Margaret the secretary. "Hi, I'm Alan," he told her and they vigorously shook hands. Margaret smiled and said, "Well, I'm Maggie and it's a pleasure to have you. Let's go this way; I have a car and we'll go up to the Hill." She walked like this was a speed march. "Nice trip?" "Yes, very relaxing time on the boat." He then chatted on about the long airplane journey as he managed to keep up with her into the "foreign passenger" part of the shed. Just then he spotted Carla with some of her band-mates, but she didn't see him. Flustered, he turned back to Margaret, "I definitely loved the impromptu music on board the ship." 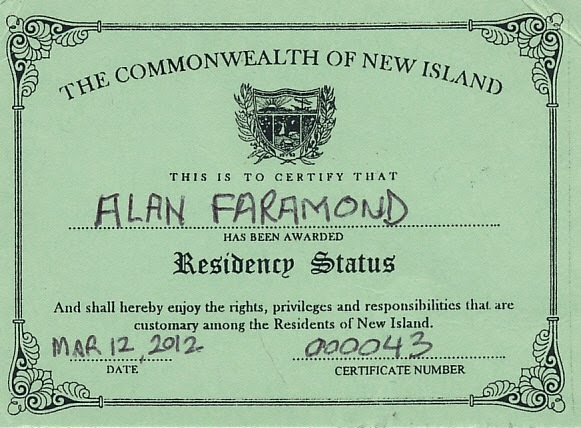 At the customs line, Margaret gave Alan a green card. "Here, sign this and you can legally stay here as long as you like. The customs agent will want to see it, along with your passport." The agent at the gate greeted Alan like a long-lost soul, surprising him. He asked a few questions, seemed pleased at Alan's replies, stamped his passport, and moved them through with a wink to Margaret. Alan was getting the idea that she is well-known here! It was a fast trip to the Ministry of Trade. Margaret led Alan upstairs to the Tourism office, and Wainwright greeted him warmly. "We've been looking forward to meeting you ever since Maggie here so excitedly reacted to your drawing! I trust you had a pleasant journey, yes? I have met only a few Americans, and very few of us here have ever ventured to the States...a frightful place if you believe the news we get here... Now, let's have a seat and we'll get on with it. "I have a list of places we would like you to depict, Mr Faramond, places that we think speak strongly about this island-nation of ours. I'm sure you'll have questions, which Maggie should be able to address. Here is the list, and there are phone numbers so that you may reach us. I've secured a 90-day rail pass good on all the trains, busses and streetcar lines throughout the island, but unfortunately, I'm not able to give you a car. But then, many of the locations will be accessible only on foot! Here is also the address of the lodgings we have reserved for you, a train schedule, and a road map. Any questions Mr. Faramond?" Alan looked over the paperwork (what a list! ), then at Wainwright, a genial-looking guy he hoped he could rely upon. He was getting a little nervous about all this: it was really happening, he would be sent out to wander around this island and draw pictures for a guidebook. Did they think he could really pull this off? Are the natives friendly? Alan sure hoped so! "Ahh, I'm wondering how long, or how much time I'll have to do these drawings?" "Well, said Margaret, as long as it takes, I'm sure." Wainwright nodded in agreement. They stood there a moment not saying anything, and Alan couldn't think of any more questions, so he said "I guess I'll be going now..." and Margaret offered to drive him to his lodging downtown. ...and now entering Victoria Harbor. After another evening of dancing (for a while) and reading in his bunk, Alan rested well aboard the ship. The rolling of the swells helped lull him to sleep, and he began to feel a connection with the rolling of the ocean under the ship, something very comforting. The next morning, he walked around the decks hoping to run into Carla, but she was not to be found. He did spot land off to the west, however. "This must be the New Island coast", he thought. "Wow, a whole new place." Alan realized that he was actually seeing something new with nothing to guide him - no Google maps, Vimeo pictures, Lonely Planet Guides, pages about the details on Facebook, or anyone telling him about all the must-see places the author had already been to! He had wondered at this at first, but Alan felt he wouldn't question things here too closely, such as why Google Earth, and his old atlas, only presented open ocean where this place should be. He had his ticket, and a real letter of intent offering him a job that seemed ideal...wander around and sketch the scenery, how cool is that? At almost noon, the Charles Ames pulled up to the Australia Dock in Victoria Harbor. Alan saw that this was not nearly as big a city as he imagined; no high-rise buildings, no big resorts on the beach, just small houses and some larger buildings visible along the waterfront and on the lower hills to the, um, east. The surrounding hills were an astonishing green, and looked completely uninhabited. And was that snow on the tall mountain? Cool! Late the next morning, while out walking the deck, Alan looked up to see the the singer from last night waving at him. She was on the boat deck, one flight up. He waved back, then climbed up the stairway to meet her. "Hi, I'm Carla," she said and held out her hand. He shook it, and finally held her gaze, as he was reminded to do a few times by Michelle (and his counselor) back in Michigan City. "Well, um, pleased to meet you. I'm Alan," he told her. "And I'm wondering if we have met before. I mean, am I someone you've seen before?" "Well, that's why I wanted to say hello, Alan. I saw you while I was singing last night, with a feeling that you were someone. I mean, someone I might know, or that I should know... You seem somehow like family or something." Alan looked at her and felt that this was getting strange...but he too felt a connection, a faint memory, a recognition of some sort. Then they both relaxed a little, and looked out at the ocean from the railing. After a few minutes, Alan said, "My family is from California, in the USA, and I've been living in a town called Michigan City, in Indiana, in the American Midwest, for the last several years. Um, does that mean anything to you?" "Okay, well, I was really just hanging on there, making drawings and wondering what I'll do next...you know? Then I got this letter from someone named Margaret Mullen, Dept. 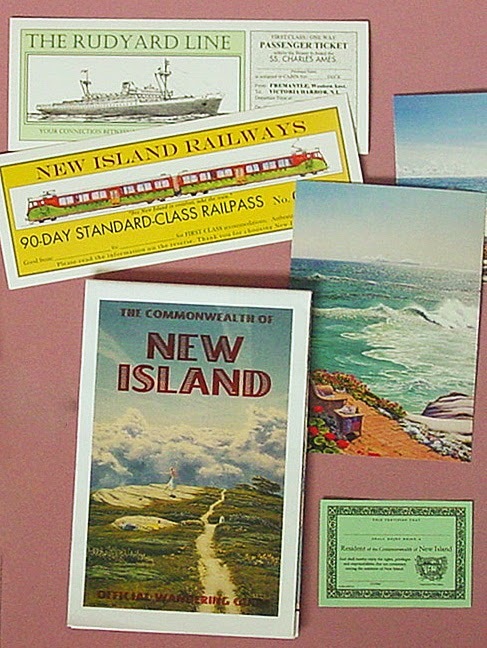 of Tourism, Commonwealth of New Island, about illustrating a tourism guidebook. They offered me a ticket, at least one way, lodging, and a weekly stipend, so I said I'd do it! I'll get a return ticket when my job is done, I think." "Wow, a paid-for gig. That sounds really cool! They're going to put you up somewhere?" "Yes, this Margaret said they have an apartment for me that overlooks Putney Bay, where I'll have peace and quiet and easy access to most of the island for my sketch trips. I'm supposed to meet her and her boss Wainwright Stevens in Victoria Harbor. Then I assume they'll send me out to where I'm to make these sketches. It's all a bit vague..."
"Hm, I'm wondering why they couldn't find someone local to do this...I mean, how did they ever find you? No offence of course, but it seems a bit incredible." "Well, Margaret somehow got hold of a drawing of mine, and said I had depicted her childhood home, including her toy wagon, when I had actually just made it all up. I've been drawing and painting these places from my head for years now. And drawing them seems to help me stay alive, especially when I look too closely at the real world...is this making any sense?" "Uh, yeah, I think it makes a lot of sense. And maybe that's what made me 'recognize' you. I got a feeling that you might be someone I'd seen a long time ago, back where I grew up." Carla looked at him, and Alan didn't know what to think. He finally said,"It seems that on one reality, we've never met, but on another, maybe we have...do you get what I'm saying? And I'm not flirting here if that's what you might be thinking!" "Uh, no," she smiled, "I don't think you are, and I'm not flirting with you, but I'm very glad we've met, um, now!" A bit red-faced, he grinned at her, and then they both looked out again at the ocean. "Hey," Carla finally said, "I gotta go, so here is my card and if you ever need a place to stay during your sketching excursions. Don't hesitate to get hold of me, OK?" "Yes, I'll do that. Thanks!" Alan was delighted - now he felt he had some kind of human connection here, someone besides his employers. He gave her a quick smooch on the cheek and then she grabbed him and hugged him - a warm heartfelt hug at that. Alan was surprised at first, but then he could feel all tension and doubt drain away. He began to feel glad that he came here! Alan wanted to listen to the singer with that wonderful voice. He thought it sounded like that Scottish group Capercaillie. The music stirred up something inside of him, but he didn't know what exactly was going on. It sure felt good, though. While he watched the dancing, he sipped on a Moscow mule at the cantina bar. They also served hamburgers, so while having one of those and a second mule, he began swaying to the music, especially when those drums took over. Again he turned his attention to the singer, her voice so melodic. Then with a wild look in her eye, she glanced at him, making him look away, and feel all fumbly. She kept it up, so finally he smiled back at her, and she nodded to him, ever so slightly. What is this about? Does she know me? Maybe he was just hyper-aware of anyone's notice because he was so far away from home, or that he had for some time now been so unsociable, so cut-off...? 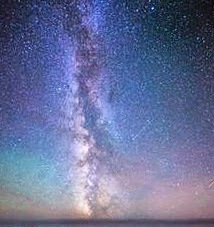 As the night grew deeper, Alan noticed the Milky Way rising straight up above the ocean, arcing high above the ship and then back to the opposite horizon. Wow...he had ever seen it so vividly before, and it seemed so close, so intense! Again, he felt that something is definitely different here. He loved the thought that he is sailing on the Southern Ocean - how exotic! While staring up at the immense core of the galaxy, Alan had a strong feeling that this trip was already touching something deeper than than anything he has ever known. A little dazed, he finally went to bed.